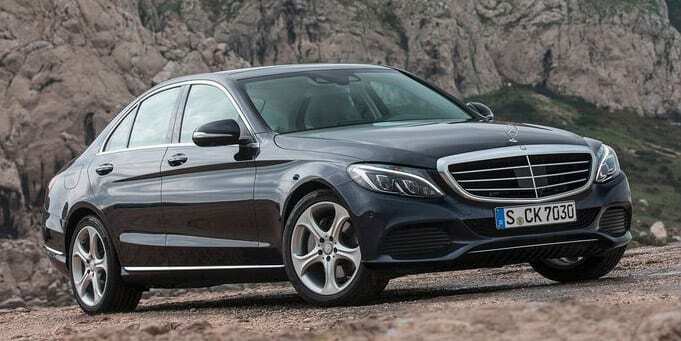 So here’s why the new Mercedes-Benz C-class matters, really matters. Created in 1992 to replace the legendary 190 and nicknamed ‘the baby Benz’ internally by Mercedes, the C-class has beeen the three-pointed star’s best-selling car ever since. The previous fourth-generation model was bought by 2.2 million people globally. To date, some eight-and-a-half million C-classes have been sold to, and mostly adored by, their owners around the world. Indeed, more than 20 per cent of all Mercedes sold today are, yes, C-classes. What’s more, this fifth-generation car needs to hold the fort for another seven years for Mercedes, because the next one won’t appear until 2021. So if ever Mercedes needed to get a car right, and get it right from the word go, this is it. Which is why Mercedes has thrown everything at the car this time round. Inside and out, the new C-class, says Mercedes, “feels like a free upgrade into business class”. Its cabin is a thing of rare quality and beauty, featuring a level of sophistication that, as we’ll discover, elevates it above and beyond any other car in this class. It’s a touch bigger than before, both inside and out, but, crucially, it’s also between 70kg and 100kg lighter than the previous model. And it’s more aerodynamically efficient, which, in turn, helps it to be more ecologically efficient – by about 20 per cent, Mercedes claims. So despite being the replacement for a car that was already way better than decent, the new C-class represents a giant leap forwards – according to Mercedes. All of the various engines and gearboxes that power and propel the new C-class have been comprehensively uprated or, in some cases, replaced. In the fullness of time, there will be anything from a 1.6-litre diesel to a hybrid to a twin-turbocharged V6 petrol engine available beneath the car’s svelte new bonnet, but the model we’re concentrating on here is the C250 Bluetec turbodiesel, likely to be one of the most popular choices in the UK when the new C-class becomes available in June. Initially, there will be just three trim levels: SE, Sport and AMG Line. And you will be able to tailor your new C-class in whichever way you wish, inside and out, by playing DJ within these trim variations. Thus, if you want your new C-class to look and feel sporty inside but appear conservative outside, you can opt for the AMG Line interior with the more subtle SE exterior, or vice versa. Prices start at around £26k for a basic C200 SE, with the C250 Bluetec starting at just over £30k and a fully stacked C250 Bluetec AMG Line like our test car topping £35k. And as ever with Mercedes, the options list is long. As well as having the AMG Line trim inside and out, our test car had air suspension (£895) and most of Mercedes’ new driver assist options. Although £35k plus might sound like an awful lot of money for a four-cylinder diesel C-class, what you get in return is an awful lot of car. The engine is Mercedes’ familiar 2.1-litre, four-cylinder turbodiesel, which produces 201bhp at 3000-4200rpm and 368lb ft of torque at 1400-2800rpm, giving the C250 Bluetec a 0-62mph time of 8.1sec and a top speed of 155mph. The gearbox is a seven-speed automatic with paddle shifters. The equivalent BMW 3-series – the 325d M Sport – is a touch quicker but not as economical and not as well specified inside, if the option lists are similarly aligned. The new C-class may look unusually sleek, especially with the AMG Line styling upgrades in place, but its watchwords are, in fact, mostly to do with emissions and economy. The knowledge that the car can return a theoretical 65.7mpg on the combined cycle and produces just 113g/km is, according to Mercedes’ engineers, of rather more significance than an ability to hit 60mph in a mere eight seconds. Having said that, the chassis, steering, brakes and suspension have all been comprehensively redesigned, to a point where Mercedes now claims that the new C-class is the best car in its class to drive. They, the engineers, are exceedingly proud that their new car weighs as little as it does, chiefly as a result of it containing approximately five times more aluminium than the previous model. But reducing weight was, says Mercedes, a key factor in providing the new C-class with longevity. Get the weight right, and the aerodynamics, and in fundamental terms the car will naturally become more efficient as its lifecycle evolves, when its engines and gearboxes are gradually upgraded and its software improved over time. Getting the weight down costs money, though, because the materials required – aluminium, basically – aren’t cheap. But to get the aero qualities just so merely requires brain power, plus a few hundred hours in a wind tunnel. And Mercedes is happy that it has hit the bullseye in both cases. Do we agree? In most ways, yes; the new C-class is indeed a surprisingly lovely thing to drive. Its rack and pinion steering system may be electrically power assisted – again to improve fuel economy by that little bit extra – but the feel and accuracy that it provides on the move are close to breathtaking at times. You can place the nose of the new C-class to the nearest millimetre in most corners, and although the assistance is quite strong, there is genuine feel on offer beneath your fingertips. The chassis, certainly in the case of the car that we drove, feels every bit as good to go with it. There is a delicious fluidity to the way that the new C-class tackles most roads. It feels almost as if the car itself takes one good look at what lies ahead, works out precisely what’s required and then dials up the perfect mix of settings to enable you to sit back and enjoy the ride. Five drive modes are available, with Eco at the bottom and Individual at the top. In Individual you can set the engine and gearbox, steering, throttle and dampers to whatever levels you wish, independent of one another – so if you want the dampers on the softest setting with the engine and gearbox on super-sport, no problem. And beneath this, there are four other settings in which all of the car’s various systems can be tuned simultaneously to respond in whatever way you might require. Sounds complex, and is complex, but it does allow you to dial the new C-class into a road and make it react accordingly (rough road, soft suspension; fast, smooth B-road, sharper steering and crisper dampers and so on) in a way that 10 years ago no C-class driver would have dreamed possible. What’s less successful, however, is the new touchpad screen that sits just behind the regular round Comand controller, which you use to adjust the car’s various systems. For some reason, Mercedes has provided drivers with the option of a touchpad screen plus the rotary dial that rotates to enable you to scroll through the various menus (navigation, phone and so on). No one at the car’s launch could explain why we now need two different methods to access the same information. In most other departments, though, the new C-class delivers, and delivers exceedingly well. It’s a fair bit roomier than before and a lot more luxuriant inside, and it steers, rides, stops and handles beautifully. It also changes gear rather tidily when equipped with the new seven-speed automatic gearbox, although the lesser four-cylinder petrol version will come as standard with a new ZF-designed six-speed manual, which we haven’t yet tried. But there is one caveat to mention, and in the context of a first initial experience of what is likely to be one of the most popular models, it’s a big one. And it’s the engine. For starters, it’s noisy and clattery for a Mercedes, especially from the outside. Secondly, its responses are peculiarly blunt unless you select the sportiest setting within the new Agility system. Thirdly, it doesn’t deliver anything like as much basic performance as you’d expect, given that it has 368lb ft to propel 1550kg. The car doesn’t feel in any way slow, but neither does it ever feel explosive like the equivalent 3-series does in the mid-range, and that’s a fairly disappointing discovery, given that this is, for the time being, the sportiest new C-class that money can buy. Perhaps it’s simply the result of the rest of car being so deeply excellent, but the overall impression of this particular new C-class is: brilliant car powered by a so-so engine. With a couple more cylinders beneath the bonnet, though, I’m sure the genius within will be revealed.